We were Munchkins before is was cool. Hipsters adds 30 new cards that will let you defy The Man while wearing your Knit Cap and sipping on your Nonfat Soy No-Whip Skinny Half-Caf Fair Trade Ventitre Mocha Latte. Even though it's so last year, you can fight the Indie Band using your Artisinal Chunky Black Glasses and go up a level when you Reject the Conventional. This is an expansion for Munchkin. It is not a stand-alone game. 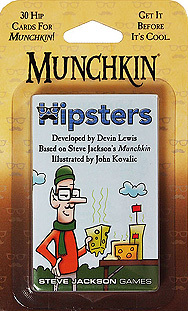 This is NOT a collectible or randomized set, every Munchkin Hipsters pack is the same as every other.